Size of this PNG preview of this SVG file: 800 × 533 pixels. Other resolutions: 320 × 213 pixels | 640 × 427 pixels | 1,024 × 683 pixels | 1,280 × 853 pixels | 1,026 × 684 pixels. 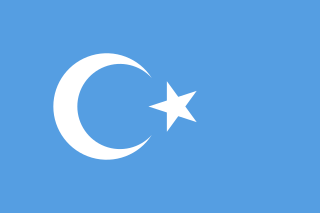 English: "Kokbayraq" flag, used by the Uyghurs as a symbol of the East Turkestan independence movement. The Chinese government prohibits using the flag within China.